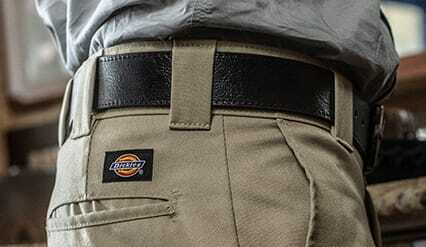 Fueled by in-depth customer insights drawn from active autoworkers and specially built for today’s automotive workforce, the Dickies Automotive Shop Collection features new innovations while maintaining the advanced level of quality, durability and comfort that working professionals have come to appreciate from Dickies. 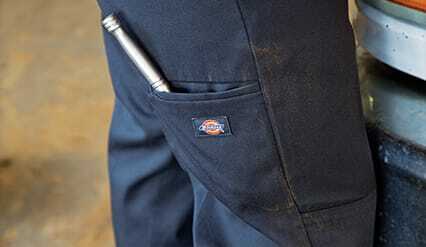 Our unique fabrics, features and fits will improve the comfort, mobility and performance of the worker. Workers are athletes. They need to stretch, reach, bend and climb, therefore we created a line that will ensure they can perform all of these activities on the job. The Shop Collection Line is built for today’s workforce. In addition to our easy care, wrinkle resistant and stain release fabrics, the new line features lighter weight mechanical stretch breathable fabrics, advanced cooling mesh technology, moisture wicking that provides comfort to the workers, delivering enhanced innovation through construction and fabrics. Continuing our legacy with our new field-proven, purpose-built automotive collection, every detail is engineered with the comfort of the worker in mind. Equipped with features like Flex fabric with wicking, stain release and wrinkle resistance for comfort and easy care, as well as, easy access multi pockets to meet the demands of the job.